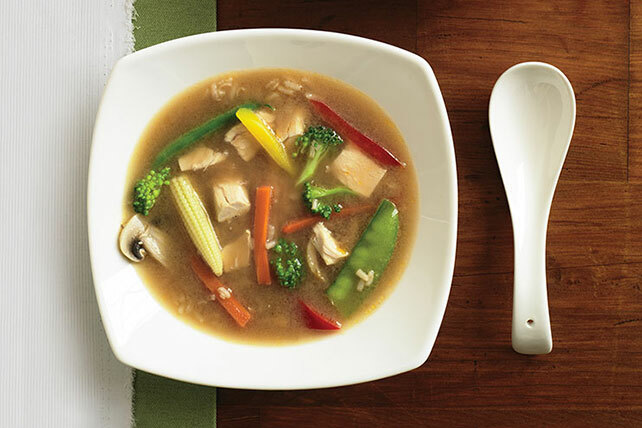 Combine chopped cooked chicken, stir-fry veggies & brown rice for this Asian soup recipe. Our Speedy Asian Soup Recipe is ready in less than 20 minutes! Add 1/2 cup of each of the remaining ingredients to each bowl; stir. Cover with waxed paper. Microwave on HIGH 5 to 7 min. or until heated through. Let stand 5 min. before serving. Carefully remove the hot filled soup bowls from the microwave since the soup and the bowls will be hot! Prepare using instant white rice.